Texas Democrats don't have a full slate of statewide candidates — and certainly nobody famous — at the top of their 2018 ballots. Maybe that doesn't matter. Texas Democrats don’t have a statewide slate. This is the place where a columnist has to add the word “YET,” since there are two more weeks for candidates to file for office. Texas Democrats don’t have a statewide slate YET. And this isn’t the standard-issue election opener about how Texas Democrats are cooked and there’s no need to check their pulse; this is about voter turnout and how to win down-ballot elections without big-time candidates making news and advertising and stirring things up. 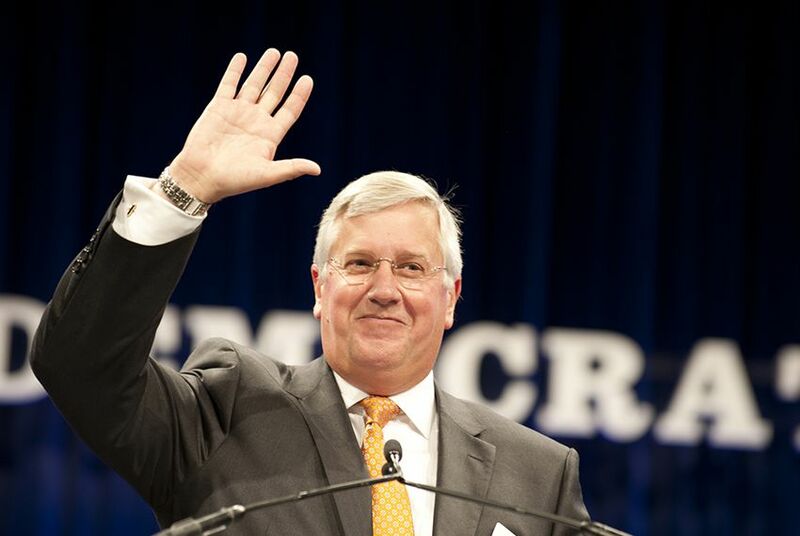 Mike Collier, a Democrat running for lieutenant governor, has a theory about this — that it’s the down-ballot races that drive people to the polls. He has to say that. He’s a down-ballot candidate. But he’s also a numbers guy — an accountant by profession — and contends that the door-to-door campaigning of House and Senate candidates does at least as much to drive voters to the polls as a noisy top-of-ballot affair between well-financed political stars. More people turn out to vote in presidential election years than in the midterms where Texans elect most of their statewide officials. That’s the biggest bit of evidence that titans drive turnout. And Collier’s point might seem strange, coming from someone running near the top of the ballot. But scores of candidates from all parties have learned that not-quite-top-of-the-ballot candidates do not really control their own fates. With some exceptions, they’re subject to what’s going on above them on the ballot or to outside influences. It’s hard to win a race when your party’s top candidate is only getting 38.9 percent of the vote (Wendy Davis in 2014) or 42.3 percent (Bill White in 2010). But there is also a chance that the political atmosphere is good for your party — a hope every minority party carries into every presidential midterm election — and that the political winds will favor the challengers. That’s how many Texas Democrats are looking at 2018 — that Donald Trump, like many other presidents, will have a hard ride in his midterm elections and that it will be better to be a Democrat in a close race next year than to be a Republican. U.S. Rep. Beto O'Rourke of El Paso will be at the top of the Democratic ticket, waging a long-shot campaign against U.S. Sen. Ted Cruz, who took office after his own long-shot campaign in 2012. Several Democrats have been mentioned as or are talking about running for governor, a list that includes Houston City Councilman Dwight Boykins, Dallas County Sheriff Lupe Valdez, Andrew White (son of the late Gov. Mark White) and Michael Sorrell, president of Paul Quinn College in Dallas. Candidate filing will be open for another two weeks — until Dec. 11 — and these or other candidates still have time to get on the ticket. Maybe some superstar will show. Voters can decide then, when the lists of candidates are complete, what to do in the March primaries. To a large extent, the eyes of Texas will be on the Republicans, with the combined spectacle of open seats and a GOP split in any number of ways — between conservatives and moderates, populists and the establishment, and conservatives focused on business and those focused on social issues. The state’s congressional delegation has six open seats following the decisions by two Democrats and four Republicans (so far) not to seek reelection. All six of those districts were drawn to favor the parties of the people now in office; without something extraordinary happening, party changes in those spots are unlikely. The same is true in three state Senate districts where incumbents — Craig Estes, R-Wichita Falls; Bob Hall, R-Edgewood; and Kel Seliger, R-Amarillo — will be challenged in the primaries. The elections are more likely to change the occupants of those offices than the party that holds them. The Texas House always has a dozen or so seats that could, if circumstances and the candidates are just right, move from one party to the other. But the real contests are in the primaries, and particularly in the Republican primaries. Texas is an open-primary state, where voters can decide from year to year whether they’d rather help decide the Republican or the Democratic nominees (or hold out and go to third-party conventions). If the action is on the GOP side, or if that’s where the most important local elections will really get settled, some Democrats might be attracted to those contests. Maybe Collier’s right. Maybe 2018’s politics will be local. Analysis: The biggest threat to Texas Republicans? Texas Republicans.